From its beginnings in the mid 1980s, 3-D printing has evolved from simple rapid prototype manufacturing, to now include advanced fabrication applications within construction, medical, electronics, and consumer product industries. Furthermore, this technique is now widely used for automotive and aviation parts fabrication; Local Motors™ is now taking pre-orders on complete 3-D printed cars that will soon reach the consumer market. The cost of 3-D printers has been declining steadily, which will significantly impact the future of manufacturing within virtually all industrial sectors. One of the latest areas to be explored by this technology is bioprinting. Sounding like a page out of a science fiction novel, 3-D printing techniques have been used to generate prosthetic limbs, titanium bone implants, blood vessels, and even a complete jawbone. Chinese researchers have recently reported the successful 3-D printing of human organs using living tissue. In fact, it has been predicted that fully functional printed organs may be realized within the next decade. Beyond the research arena, a number of bioprinting startup companies such as Organovo™ utilize 3-D printing techniques to create in vitro cell culture substrates for drug testing, as well as scaffolds for drug delivery and regenerative therapy applications. 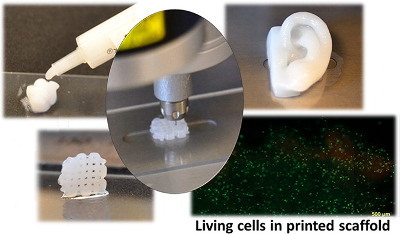 However, as one might imagine, bioprinting offers significant challenges relative to traditional 3-D printing techniques. In addition to exhibiting desirable physical properties such as mechanical strength, rigidity, and shape tunability, bioprinted materials must also be biocompatible and non-toxic. Accordingly, the development of suitable bio-inks—the printable matrix required for bioprinting—has been the focus of recent research. The report by Loo et al. (Nano Lett. 2015, ASAP; DOI: 10.1021/acs.nanolett.5b02859) describes an important precedent in the development of bio-inks for the printing of biological constructs. Their design features short synthetic peptides that demonstrate stimuli-responsive self-assembly under physiological conditions. In particular, peptides with cationic polar headgroups were chosen, which were shown to effectively self-assemble into 3-D nanofibrous hydrogels. Most importantly, due to their amphiphilic property, the hydrogels retain > 99% water, which will preclude their dehydration during the printing process. Furthermore, their reported procedure gives rise to tunable hydrogel structures (and associated mechanical properties) through varying the amino acid sequence, number of repeating units, and concentration. Additional structural control may be afforded by varying the solution conditions (pH, temperature, and salt concentration). The gelation process readily takes place at temperatures of 25 – 37°C within phosphate buffered saline solutions, which will prevent thermal damage to co-entrained cells and tissues. Relevant for scale-up considerations, in which bioprinters require the use of fine-gauge needles and thin tubing, the peptide solutions are soluble in water with low viscocity – even at temperatures as low as 4°C. For proof-of-concept studies, an in vitro model for skin was fabricated using a multicellular, multidomain construct within a polypeptide hydrogel matrix. In contrast to collagen hydrogels that undergo significant shrinkage over time, the peptide analogues were reported to retain their overall shape and dimensions over a 3-week timeframe. Lastly, in vivo biocompatibility of the peptide hydrogels was successfully demonstrated by subcutaneous implantation into healthy mice, which did not cause any noticeable degree of immune response. In summary, hydrogels fabricated through the self-assembly of short peptides offer a tunable means to generate bio-inks for a variety of medicinal applications. Not only do the reported gels offer biocompatibility and tunable mechanical properties, but their surface may also be functionalized by simple click chemistry to promote cell compatibility. These properties are desirable attributes for regenerative medicine, in order to reduce the immune rejection response in vivo. It is likely that this class of bio-inks will find many applications for bioprinting as this exciting field continues to evolve.